In a scathing editorial warning Trump to back off on his latest tariff threat, on Sunday China said that any trade deals between the US and China, and any progress and commitments made so far in bilateral negotiations would be withdrawn if President Donald Trump follows through with this threat. "If the U.S. rolls out trade measures including tariffs, all the agreements reached in the negotiations won’t take effect," the state-run Xinhua News Agency reported this morning, citing a statement from the Chinese team that met with a U.S. delegation led by Commerce Secretary Wilbur Ross, which arrived in China overnight. Separately, China has continued to express growing frustration with the tactics deployed by the White House, and an editorial in the nationalist, state-run tabloid Global Times said that "the U.S. can’t have its cake and eat it too," adding that the U.S. "needs to choose between tariffs and exporting more to China." China's anger is the result of Trump’s revival of the simmering trade war between the two superpowers after Trump last week unveiled a plan to slap tariffs on $50 billion of Chinese imports, casting into doubt ongoing trade discussion about how to reduce China’s $375 billion goods-trade surplus with the U.S.
As Bloomberg clarifies, the Xinhua report came out on Sunday after Ross met with Chinese Vice Premier Liu He for talks that Ross called “friendly and frank, and covered some useful topics about specific export items.” At the same time as negotiators focus on technical steps to reduce the U.S. deficit, Trump’s aggressive reversals have rattled Beijing as it raises concerns about the possibility that any agreement made could be simply torn up by the president. Meanwhile, suggesting that all the progress achieved over the past two months in trade negotiations would be lost if Trump follows though with tariffs, a commentary by state-run China Radio International said that the government’s stance on canceling any agreements reached in the talks if Trump’s tariffs go into effect was a "red line." Meanwhile, the negotiations continue. 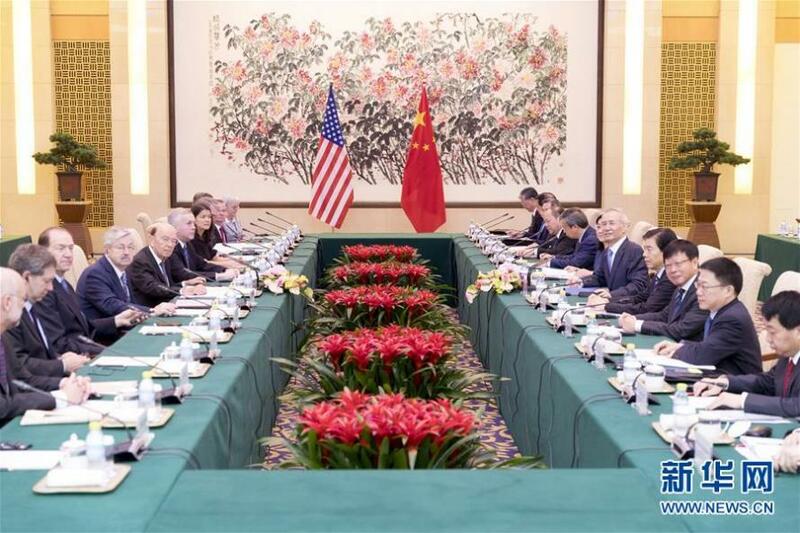 According to Bloomberg, the Ross-led U.S. delegation, which was in Beijing for two days, included energy and agriculture experts, reflecting the U.S. desire to increase exports of natural gas and food. On the Chinese side, officials including Commerce Minister Zhong Shan, Central Bank Governor Yi Gang, Vice Agricultural Minister Han Jun, and Li Fanrong, vice minister of national energy administration, accompanied Liu in the talks, according to a media pool report. During his visit, Ross has been looking to build on a vague joint statement released May 19, after negotiations in Washington. China pledged then to take steps to “substantially” reduce the U.S. trade deficit, including by buying more American farm goods and energy, though it didn’t commit to a dollar amount. However it now appears there was again no formal conclusion or announcement of "success" following this latest 2-day blitz. Ross, meanwhile, finds himself torn, and under pressure from U.S. lawmakers to stay tough on Chinese telecom-equipment maker ZTE Corp even as Trump has said he is willing to forego sanctions against the company in exchange for a large fine and management changes, as well as China's greenlighting the NXP-Qualcomm deal. Republican Senator Marco Rubio and other lawmakers from both parties have questioned Trump’s leniency toward ZTE, arguing the company represents a security risk. As Bloomberg adds, the stakes remain high for the global economy, and any collapse in trade talks could lead to a sharp slowdown in the global economy which is "cruising at its fastest pace of growth in seven years." But the International Monetary Fund has warned that a trade war could threaten the recovery, and policy makers are contending with a growing list of geopolitical risks, from a political crisis in Italy to the rocky progress of peace talks with North Korea. The best summary of recent negotiations, however, comes from Goldman's chief economist Jan Hatzius who overnight writes that "less than two weeks after Trump Administration officials declared that the “trade war is on hold,” policy has shifted substantially. Following trade announcements over the last few days, the trade war does not appear to be “on hold” but simply "on."